Easter is celebrated all over the world and in many different ways. The Spanish commemorate the whole week of Easter, the Semana Santa, very religiously. Find out which traditions are popular in Spain! Easter is the biggest holiday and celebration of Christianity, the resurrection of Jesus. Most Christians refer to the week before Easter as Holy Week, which includes the days of Easter Triduum, Maundy Thursday – commemorating the Maundy and Last Supper – as well as Good Friday. For most families, this is the biggest reunion event among Christians as the Easter holiday is rich with history and symbolic references. It is said that the lamb eaten during this time symbolizes Jesus’s sacrifice, while the wine symbolizes Jesus’s blood and the eggs serve as symbols of reincarnation. Whole boiled eggs also refer to the union of the family, life and rebirth. Easter in Spain (Semana Santa) is a time when Spaniards take to the streets to celebrate and enjoy their time spent together with family. During this time, there is a lot of processions, customs and even more culinary specialties to be enjoyed! The Spanish value Holy week greatly, from Palm Sunday to Easter Sunday. For eight days, you have the opportunity to relive the last days of Jesus’s life with processions, theatre and music, experiencing Easter much more intensely than you would in other countries. Because the complex processions have an immense religious, historical and cultural quality, the Semana Santa belongs to the Cultural World Heritage sites by UNESCO. This spectacle is one you really shouldn’t miss! One of the most important ceremonial acts of the Semana Santa is Jesus’ entry into Jerusalem. In this age, it was a common practice to welcome kings and other important personalities with a rain of flowers and waves of palm leaves. Nowadays, the big leaves play an important role at Domingo de Ramos. After mass, every visitor takes one palm leaf consecrated by the pastor and hangs it on a wall in their homes to protect their household from bad vibrations throughout the year. The first and most important of the processions is also dedicated to the palm leaves. Children, adults and all who want to have a feeling for Jesus’s triumphal entry accompany the festive procession with palm leaves and olive branches in their hands. Of course, you can also experience the Semana Santa on Tenerife! The amazing city La Laguna organizes the Procesión de la Burrita where Jesus enters the city Jerusalem on a donkey. La Laguna is one of the most important cities in Tenerife during the Semana Santa. The Holy Week is very similar to the one in Castilian and distances itself strictly from the one in Andalusia. The Laguneros are proud of their festivities and in the historic urban center, you can experience some of the most beautiful processions. The Spanish meaning: Put on a new piece of clothing! It doesn’t matter if it is socks, a new T-shirt or a completely new outfit – You will have good luck for the whole year! The precious saints, decorated mostly with real gold, are the centerpieces of every procession. They walk through the streets to the rhythm of drums and, at night, they use torches and candles to light their way. You can take part in the festivities or simply watch the processions of Semana Santa. The most amazing processions on Tenerife are staged in the towns La Laguna, Güímar and La Orotava. One definitive aspect of Easter celebration is … food! Perhaps all of us can remember the childhood memories in which a certain type of food was being prepared during family holidays and the whole house was filled with that savory smell. Those smells stick with us for ages and probably will for the rest of our lives. All relevant religious holidays in Spain have a reflection in the food. Although fasting strictly during Easter is now considered old fashioned, food traditions will remain for a long time. Days of Lenten might seem difficult to think of food-wise, but with a bit of research, we can find hundreds of meals on the Internet to enjoy. As for the Canary Islands, it’s really worth trying the typical dish, Sancocho, a salted fish served with potatoes, the traditional grain, Gofio, and the Canarian sauce, Mojo. After avoiding sweets and other tasty temptations for lent, Catholic Spaniards certainly know how to kick off the Holy week! As a tradition itself, making Torrijas at home is how the Spanish really celebrate Easter to the fullest, its history dating back to the 15th century. Torrijas are slices of white bread soaked with milk, sugar and egg, which are later fried in hot oil. You can also find them in every pastry shop, restaurant and bar during the feasting period. Another typical Spanish pastry to try is the so-called Pestiños, which are commonly made in southern Spain by deep-frying a piece of dough and is often mixed with olive oil, honey or sugar. 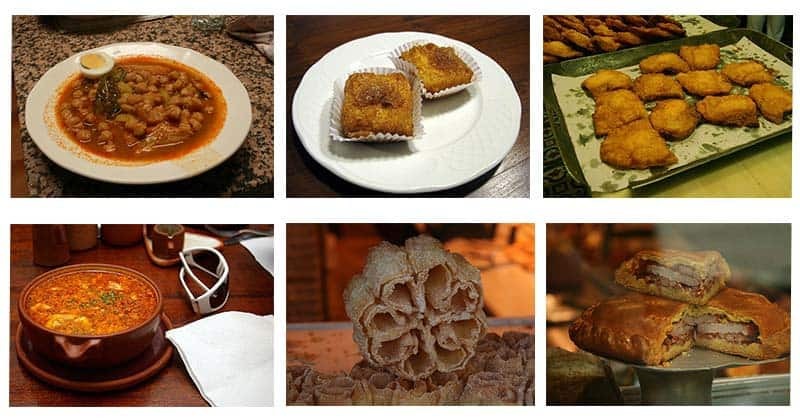 The list of tremendous sweet and savoury treats goes on and on, including Hornazo, Flores Manchegas, Potaje de Vigilia, Buñuelos, Leche Frita, Bartolillos and Sopa de Ajo. On Jueves Santo, also known as the day of grace and charity, all good Christians visit seven chapels or churches to remember the different routes Jesus Christ made before his death, from the olive grove where he was arrested to the Calvary where he was crucified. Every church and chapel is open day and night for visitors where people light candles and pray the rosary, asking for forgiveness. From Holy Thursday one of the most important processions takes place. The Viernes Santo is the day of great pain, where people think about the life of suffering and Jesus Christ’s death. In some parts of Spain, it is customary to wear black clothes: Women put on black dresses and scarves, while the men wear black suits. It’s still dark. You smell frankincense. You hear the rhythm of the carriers’ stamping feet and their heavy breathing. The first procession in La Laguna on this Holy Friday starts at four o’clock in the morning! Before sunrise, the Procesión de Madrugada – the procession of the break of dawn – kicks off the day’s festivities. One procession a day isn’t enough for the Laguneros. At 22:00 on Holy Friday, the procession starts in silence. Everyone comes to their senses in the La Procesión de Silencio, when the only thing that breaks the silence is the ringing of the bells that are fixed on the throne. Very slowly, they move ahead out of respect for the saviour and in this moment, the community has compassion, pausing devoutly. You can not only witness the Semana Santa in the north of the Canary Island, but also in the south. In Costa Adeje a true-to-life spectacle takes place every year: Around 400 amateur actors reenact the final period of Jesus’ life, also called the Passion. Broadcasted live on international TV with thousands of visitors, it’s the biggest spectacle of Semana Santa on Tenerife. Have you always wanted to act in a real theatre? Then sign up to be an actor! From 8:00 to 22:00 you can enroll in the Centro Cultural de Adeje. The contemporary market feels like a trip back in time. There you can buy typical food and local animals like goats, horses, sheep and camels. The last day of the Holy Week is celebrated with water in some villages in Valencia. Don’t be surprised if you’re walking down the street and suddenly a splash of water is thrown on you or a plate accidentally ends up on your head. The resurrection of Jesus is commemorated by a new beginning: This means old contents are disposed of and thrown out of the window. As the Christians of the time weren’t allowed to wash themselves during the Semana Santa until Holy Saturday, the wash day was celebrated extensively and every person was washed whether they wanted to be or not! All of Spain celebrates the day of the Resurrection of Jesus differently, painting eggs in colors, as they represent either the unity of the family or the blood of Jesus. This tradition has been going on since the year 1767. In other places, a corn dolly is burned or the pastor throws sweets from the balcony to the crowd after mass. On the Canary Island La Palma, people don’t search for eggs, but for the sculpture of Saint Mary. During the Procesión del Encuentro, the men walk through the streets with the sculpture of Jesus while looking for the sculpture of Saint Mary. The pastor is welcomed by loud shouting and children pelt him with plants so he has to take refuge to the crowd. From there, he throws coins and sweets to the children. Beware of climbing up a tree! You could transform into a monkey. You shouldn’t take a bath in a river. Perhaps you will change into a slippery fish! Avoid wearing red clothes! This represents the evil ghosts, which you really shouldn’t attract during the Holy Week. You see, the Semana Santa is full of customs and traditions that are so diverse and quaint they can only exist in as crazy of a country as Spain! And on our favourite Canary Island, Tenerife, there is something for everyone to enjoy. So, let’s go to La Laguna to the impressive processions or to Adeje for the once-in-a-lifetime opportunity to play a Roman soldier! Have a lot of fun and a nice Semana Santa! Check our event calendar for upcoming events on Tenerife all year round! 353 queries in 2.909 seconds.